Full Description: The Collection includes a group of publicity cards, adverts and postcards of "George Young, Blind Musician". In most, he is seated on a turned-wood chair holding a Lachenal Edeophone metal-ended English concertina, with a 48-key metal-ended English concertina on a nearby pot-stand. 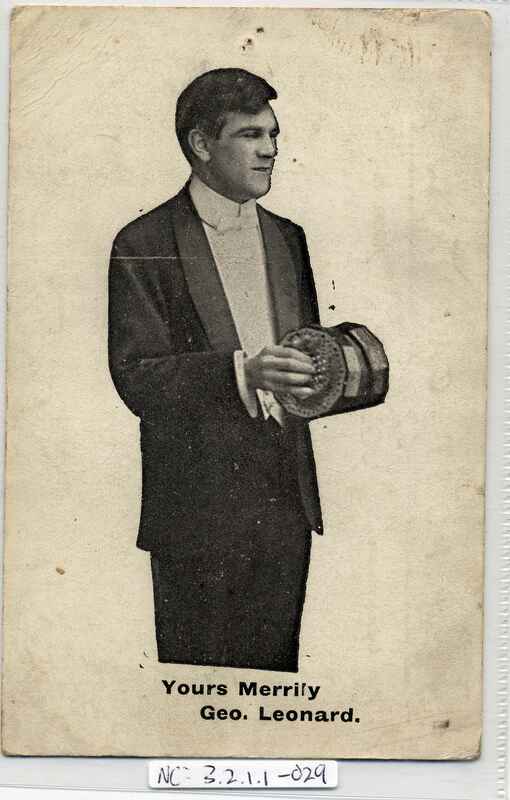 This card, however, has just the image of the man on the George Young cards, but with the differently-named caption "Yours Merrily - Geo Leonard"!! See Items NC: 3.2.1.1-008 to NC: 3.2.1.1-012 for the Geo Young versions! The reason for his change of name is not known. Postally unused, "Hines, Printer, Sunderland". Divided rear.